Big paper compost bags are so handy. I bought these from an Ace Hardware store. 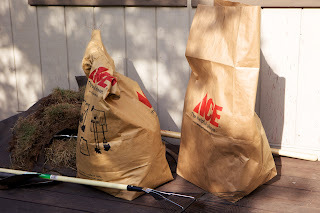 You can use them to fill up yard waste, or you can use them as big trash bags for compostable scraps. I've used them at kid's birthday parties and such for all the food scraps and paper waste. I just write "COMPOST" really large on the side with a marker and voila! They are a great alternative to plastic bags for all the yard clippings and trimmings. Explain a little more. How do you then compost the kid party scraps and paper products, for instance. We have a compost heap - but some things - like paper plates and corn-based plastic cups - don't compost very readily for us. What's your secret? Another great idea! I will have to keep these in mind as well for our neighborhood picnic later this summer. Ah, very good question midwestgreen! I am really lucky and live in a city that has curbside compost pick up. It is an amazing program, really (see the videos I posted last week on san francisco - the waste management one mentions how the compost goes full circle back to local farmers). I know many corn based plastics take far too long to decompose. Our city program cannot accept them for either compost OR recycling! They go to landfill. I try to use recycled paper products and put those in the compost. For utensils and such, I don't use disposables. I'll have to do some research on what conditions would be conducive to having paper products break down in a home compost pile. Thanks for the idea! l love these bags too!